Pro Tapes & Specialties is ushering in the fall hunting season with the introduction of a line of camouflage tape. Partnering with Kryptek, a maker of outdoor gear, the Pro Tapes version of camouflage duct tape has a matte finish to better blend in when maximum concealment is the goal. The tape is strong, hand tearable and durable. Kryptek has developed a special camouflage pattern that is available only in this product. 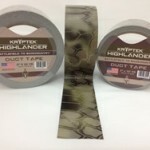 Expect to see the Kryptek duct tape for sale at high end outdoor outfitters and sporting goods stores.